As part of the festival season to promote their forthcoming album Living In Extraordinary Times, James played the main stage at Kendal Calling on Friday night. The mysterious person behind the TimBoothLyricADay twitter account kindly offered to review their set which caused much debate on the band's social media groups because of the volume of new songs. James put on a quaint little festival set in the final hours of the great heatwave of 2018. Blistering sunshine and lots of alcohol led to many ‘festival zombies’ by the time they took to the stage. There was a large crowd in attendance for the set and not wanting to ruin the occasion, they opened with Johnny Yen, now that would be a good opener for a headline act but James are not afraid of taking their own course and they jump straight from ‘the single that never was’ to Hank from their new album, released next week. Hank was made available earlier this year through an EP release and it already holds a strong position in a James set. They follow this with two more from the album, Heads and What’s It All About?, Heads has a pulsing best that keeps the crowd interested and What's It All About continues to promote the new album in good light, it still needs some work in a live setting to get it right to a James standard but still keeps the crowd. For the Greatest Hits and uninitiated fans, from three new songs we are smoothly transitioned into three of the hits; Come Home sees Tim in the crowd, a brave decision when seeing some sections of the festival crowd, Laid sees the biggest reaction from the crowd and looking to even things out by having the crowd listen to new songs, they throw in Sit Down for good measure, Sit Down will always split audiences as it is one of those songs. Fans get sick of people singing it in their faces when they mention James (experienced it a few times on Friday) but you can’t deny the unity it brings from an audience, not many attendees today would be unaware of the track, surely that is something to be proud of. Many Faces is next and Tim and the band are very proud of this new song, they stick with the radio edit which introduces the chorus earlier than the album version, and there isn’t a ‘singalong’ to end the song but the crowd seemed to be enjoying what they were witnessing. Sometimes sees Tim back in the crowd and the road managers face says it all, he’s terrified from the moment Tim steps on the barrier, follows his movement like a bodyguard, ensuring Tim isn’t dragged off into the crowd of sweaty, inebriated festival goers. Tim returns to the stage and they close the set with Attention, although it isn’t as large and deep as Sound is, it is picking up momentum and taking a course of its own as an entity in its own right. It would appear that there’s a brief discussion of an encore and they do finish a little early but they do their obligatory bows and leave the stage, the crowd wanting more and having to wait until the December tour. 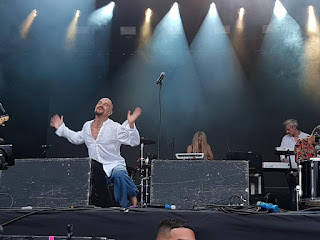 James play festival shows at Linlithgow Party At The Palace (August 11), Scarborough Open Air Theatre (18) and Drumlanrig Electric Fields (30).